Zerto Virtual Replication is a solution for transferring information from one server to another server of the same type and, of course, is based on another location and computer. This process is done by creating a copy of the information in the source and transferring it to the destination. In this connection, the so-called "computer", "publisher" and to the destination computer are subscribed or subscribed, of course, this type of relationship is possible with only one publisher but one or more common. This means that the source information is transmitted to different destinations. 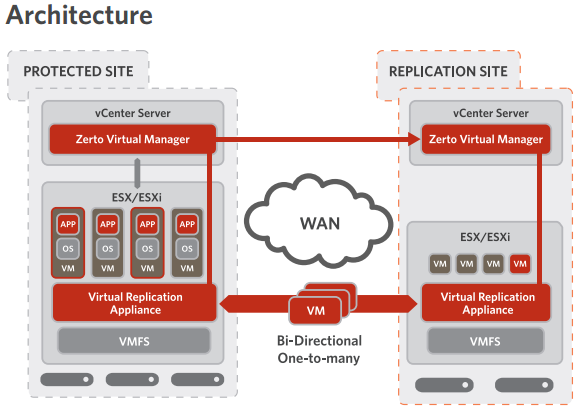 The Zerto Virtual Replication software can support the site (LAN, WAN), support for cloud computing as well as support for VMware vSphere 6.7 and mobile management capabilities. Zerto Virtual Replication 6.5 delivers IT Resilience in a single platform for disaster recovery, data protection and workload mobility to, from or between multiple clouds. By combining continuous replication with automated orchestration and enterprise class scalability, the Zerto platform dramatically simplifies IT operations and increases business agility. Applications and data can move freely into and out of the cloud providing both flexibility and mobility. Building upon the existing support for bi-directional recovery with Azure, VMware vCloud Director, or IBM Cloud, Zerto Virtual Replication 6.0 introduces the following extended features: orchestrated failback from AWS, replication between or across Azure regions, and replication from Azure to AWS, vCloud Director or IBM Cloud and bi-directional mobility between AWS and Azure. Zerto Virtual Replication 6.0 introduces enhancements aimed at long-term retention use cases, such as Journal File-Level Recovery (JFLR) for Linux file systems, significantly improving data protection and recovery. Zerto IT Resilience Platform includes out of the box analytics to provide real-time and historical analysis with dashboards and dynamic reports for monitoring across multiple sites and multiple clouds. This ensures that recovery point objective (RPO) SLAs are achieved and issues are quickly identified to minimize risks to the business. Zerto Virtual Replication 6.0 expands Zerto Analytics with new dynamic analysis reports for network troubleshooting and optimization. Expanding the Zerto public cloud story, new in Zerto Virtual Replication 6.0 is the ability to support replication from region to region in Azure. Supporting intra-region Azure replication offers customers flexibility into and out of the cloud. In addition, several new Azure regions have been added including Azure Government, Germany, and China. Completing the public cloud options, IBM Cloud is designed to be hybrid and multi-cloud supporting the ability to replicate and failover between IBM Cloud and Azure or AWS. IBM Cloud and Zerto offer customers RPOs of seconds and recovery time objectives (RTOs) of minutes. Introduced in Zerto Virtual Replication 6.0 is the ability to orchestrate failback for customers using AWS as the source. This feature not only strengthens our AWS integration but also offers freedom of choice for customers that are looking to adopt a multi-cloud strategy.